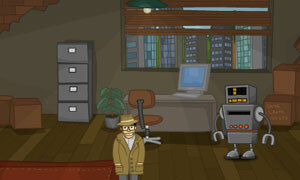 Harry Quantum 2: Unmasked is another point & click, escape game by kongregate. Harry Quantum PI is back, this time to solve a case for wrestling champion SuperBurro. Framed for a crime he didn’t commit harry has to find out who stole the artifacts from the zaztec museum and clear his name. Good luck and have fun.